Oh I hear you… “Really? Steve… Really?” Of course, many of you say that all the time while reading this site. But then again, you have now read the opening sentences of this page, so you’re to blame as much as I am. And now you’re hooked. I traveled NY 120A on my way out to the westernmost point in Connecticut (CTMQ Visit here). Those questions are unanswered no more. Note 1: If you’re aiming to find the westernmost point marker, you should avoid 120A and simply take I-684 and exit onto plain ol’ NY 120 north. Especially since the most fascinating rumor about 120A turns out to be a false rumor. Oy. Route 15 is the Hutchinson Parkway in New York and the Merritt Parkway in Connecticut. Both roads have undergone extensive and expensive renovations in the last ten years – something I’ve benefitted from greatly, as this is my much preferred route down and back from my family in Delaware. New York essentially removed the historical beauty of the road (thereby making it much safer) whereas Connecticut has attempted to maintain as much of it as possible – which I definitely appreciate. 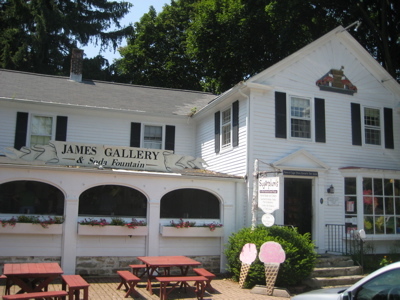 Note 2: We even have a Merritt Parkway Museum (CTMQ Visit here) and the parkway is a National Scenic Byway and is on the National Register of Historic Places. Connecticut has retained all the beautiful bridges along the Merritt, but has recently chopped down a ton of the trees that line the highway. 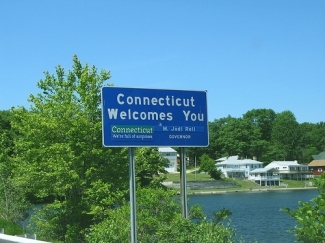 A state study of fatalities on Connecticut highways showed that from 1985 to 1992, about ten people died every three years in tree-related accidents, although no other state roadway averaged more than one in three years. There are many miles with no shoulders and there still remain some 90 degree on- and off-ramps with stop signs. I love it. Anyway, when NY updated the Hutchinson by making the exits safer and whatnot, they renumbered them. Connecticut, as is her nature, didn’t follow suit. 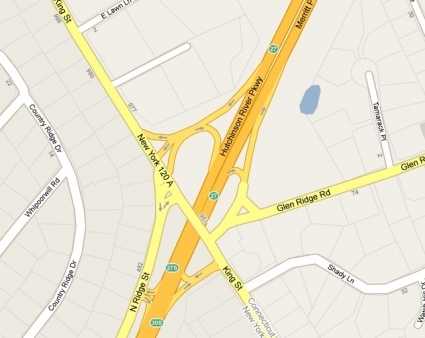 As a result, we now have the very strange interchange in the map above. So now exit 30 heading north goes to King Street (ie, 120A), but exit 30 heading south is a deathtrap to some random side road. The preceding exit is 27 heading south which does take you to King Street. It’s a mess. Once on 120A, which straddles the NY/CT border heading north for a little bit, all is well. La-di-dah. 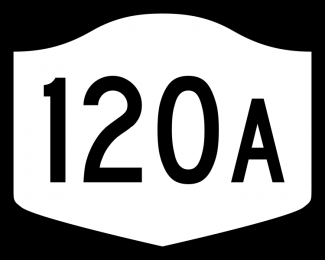 But then, the road swings east into the Constitution state – but is still officially NY 120A! This oddity become clearer a mile up the road as it swings again quite a way into Connecticut – and yet is still a NY road. Crazy, I know! 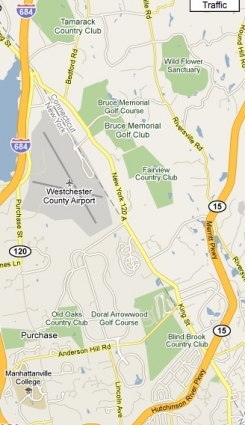 This second swing is a result of giving space for the Westchester County Airport; favored launching pad of the uber-rich who live in this area. We drove by it and saw all sorts of private jets gassing up and getting washed. Just past the airport, 120A unceremoniously ends after it swings left to reconnect with 120. What was the wild rumor about the road that I sought to confirm or deny? That on the portions off 120A which are half CT and half NY there are different speed limits. I can definitively dispel this rumor – it’s simply not true. Which sort of bummed me out. So that’s it. That’s all. And while you think this entire page is just stupid, think about it for a second… Do YOU know of any other roads that are maintained by a different state? Heck, I know of roads in CT that straddle town lines and each town only plows its lane during snow storms! They should just dump the dead animals back in New York. I’ve been known to drive the hour and 20 minutes from my place to drive this road. Great website. Interesting note: Greenwich Police Department is the only P.D. in CT that makes its new officers stand and do traffic for the first two years of their career. You can see them on Greenwich Avenue. This is all show for the rich people.